In Mary Shelley’s novel Frankenstein, Victor Frankenstein’s creation—the “monster”—eventually sees his reflection in the water, and is shocked by it, understanding at that moment why others find him so hideous. There’s a similar moment in SON OF FRANKENSTEIN (1939) too, when the monster (Boris Karloff, in his last appearance as the monster in a feature film) sees his reflection, and has a similar reaction. It’s a great moment, one that hearkens back to Shelley’s source novel. In the horror film, as in Gothic literature, the mirror is an instrument of truth—it cannot lie, and therefore can only reveal to us the terrible truth. The mirror shows us the real, and it is for this reason why so few of us wish to gaze too long at our reflection in it. Jean Cocteau said, “We watch ourselves grow old in mirrors. They bring us closer to death,” by which he meant, mirrors do not lie, and serve as constant reminders of our mortality. 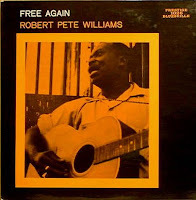 The mirror figures in blues great Robert Pete Williams’ song, I’ve Grown So Ugly, included on the album Free Again (1961), recorded soon after Williams had been released from Angola, the Louisiana State Penitentiary, where he’d spent the previous several years of his life. The years in prison have been hard and long, and Williams sings about a moment of (mis-)recognition similar to that of the Frankenstein monster in Shelley’s novel. He sees himself in the mirror, but doesn’t know himself anymore: “Oh baby, baby this ain’t me. I’ve got so ugly I don’t even know myself.” Years have gone by, and he has grown old while locked away in prison, and can no longer recognize himself. Cadillac Records (2008) probably should have been a TV mini-series, which would have allowed the filmmakers to sort out what is now essentially a jumbled mess. There is a great film in here somewhere, but not in the form it currently exists (why no extended “director’s cut” of a film that desperately needs it?). Although titled Cadillac Records, the film is, more accurately, about the rise of Chicago-based Chess Records and its founder, Leonard Chess (Adrian Brody), who founded the blues label in the early 1950s along with his brother Phil (what happened to his character in the movie?). (The title is inspired by Chess’s habit of paying his artists with Cadillacs.) The film also features Chess Records’ first major recording artist, Muddy Waters (Jeffrey Wright), as well as other artists who began or established their careers at Chess, including Little Walter (Columbus Short), Howlin’ Wolf (Eamonn Walker), Chuck Berry (Mos Def), and Etta James (Beyonce Knowles). 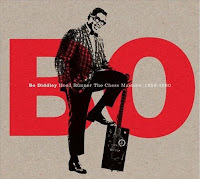 The ensemble cast gives fine performances (Beyonce gives a notable performance as Etta James), but we get only brief glimpses into their individual lives, and, astonishingly, by the film’s end it remains unclear why Chess Records should be the subject of a film in the first place. Apparently biopics of the individual artists represented are not a viable option. I was slightly perturbed by the way the film distorts history (and does so on several occasions), but perhaps the most egregious is the way it suggests, falsely, that Elvis had a hit from Little Walter’s “My Babe” early in his career. Most any detailed Elvis discography will show that Elvis didn’t record “My Babe” until August 1969, during one of his Las Vegas shows, by which time Little Walter had been dead for almost a year and a half (Little Walter died in February 1968), and—who knows—perhaps Elvis performed the song as an homage (it was not a song he performed often, suggesting this may be possible). The film also portrays Little Walter’s death as occurring before Muddy Waters and Willie Dixon travel to England in 1967 rather than after, and also suggests that Muddy Waters was slightly surprised by the reception of blues music in England in 1967, but in fact he’d toured there previously in 1958. Beyonce Knowles’ performance as Etta James is quite good; it’s unfortunate that the film has little else to recommend it. Would that I could say otherwise. 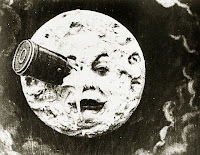 July 20, 1969: As Bogey says in Casablanca, “That was so long ago I don’t remember.” Actually, I do remember where I was, at least, when Neil Armstrong placed his foot onto the moon: in a trailer house, on a horse ranch, about twenty miles or so west of Wichita, Kansas. I was fifteen years old, just barely, and I remember the moon being full and bright that night. I was younger than my son John is now, who will turn sixteen years old in slightly under two weeks. I can’t remember the brand of television on which I watched the moon landing, but it was a small 13” or 14” black and white with “rabbit ears.” I remember the startling contrast between the technological leap the moon landing represented and the moonlit ranch surrounding me, an image straight out of the nineteenth-century American West. It happened that just a few days ago, Walter Cronkite died at 92—would that he could have lived a few days longer in order to celebrate this momentous 40th anniversary of the landing on the moon. The nightly news has replayed his reaction to the historic event many times the past few days, his rubbing his hands together in joy and saying, “Oh Boy!,” like a little kid. I think his child-like expression of glee captures my reaction as well: in order to recover what I felt, I simply have to watch that small piece of footage depicting Walter Cronkite’s response. Some great pop songs have been written about the moon, of course, and hence I dedicate the following playlist to both to the inconstant moon and the 40th anniversary of humankind’s first step upon it. Son of the god Apollo (proficient on the lyre) and Calliope (Muse of epic poetry), Orpheus was a richly gifted musician admired for his immense skill with the lyre as well as his lyrical acumen. Orpheus is thus largely seen as an archetypal figure for the poet and musician. Legend has it that soon after he married Eurydice, his young bride, she died. The inconsolable Orpheus descended into Hell in order to get her back. Improbably, he charmed the gods of the underworld into accepting his demand that she return to the land of the living with him. His demand, though, was subject to one fundamental condition: he had to walk ahead of her from Hell, and must not look back until both of them were safely in the sunlight. But, alas, Orpheus looked back at the very last moment, and Eurydice vanished. (Milton: “I woke, she fled, and day brought back my night.”) Having lost his beloved wife twice, Orpheus vowed never again to touch a woman. His swearing off women earned him the wrath of the Maenads, devotees of the god Dionysus, and as a consequence he was torn to pieces. His dismembered body parts were gathered by the Muses and buried, and his lyre became the constellation Lyra. 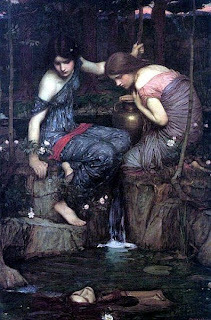 (In J. W. Waterhouse’s famous painting, “Nymphs Finding the Head of Orpheus,” his head and lyre are discovered floating side by side.) The figure of Orpheus is thus more than the archetype of the artist as poet and musician, but also the figure of the artist who has the power to exorcise death by his song, the power to descend into Hell—and return. As a figure unafraid to confront the darkness—and more importantly, to conquer it—Orpheus is a figure for immortality. Don’t look back to see. The Devil, the Hellhound, “the voice of rage and ruin”—these are all tropes for the darkness that the music serve to dispel (or at least ward off, like apotropaic magic), and why Orpheus’ singing is capable of transformation, why he allegedly could charm nature itself. This article explores the Orphic theme that informs the Nick Cave & The Bad Seeds album, Abattoir Blues/The Lyre of Orpheus (2004). There’s also Belle & Sebastian’s “Like Bob Dylan in the Movies” that references D. A. Pennebaker’s Dont Look Back (1967), an orthographically incorrect title that is apparently a deliberate reference to the Orpheus myth. The early Bob Dylan was also inspired by Johnson’s “Hellhound On My Trail”: “A Hard Rain’s A-Gonna Fall” owes as much to Johnson’s surreal, apocalyptic image of “Blues falling down like hail” as it does to metaphorical nuclear fallout. Later Dylan songs such as “Man in the Long Black Coat” also strike me as being influenced by Robert Johnson’s demonic Hellhound as well. Grammy Award-winning art director, writer, and photographer Tom Wilkes, who designed album covers for George Harrison, Ringo Starr, Neil Young, The Flying Burrito Brothers, The Rolling Stones, Janis Joplin, and many others, died on June 28 of amyotrophic lateral sclerosis (Lou Gehrig’s disease) at age 69. His obituary in the Los Angeles Times is available here. While still in his 20s, Wilkes became art director for the 1967 Monterey International Pop Music Festival, for which he created the festival’s iconic psychedelic poster (at left) that was printed on foil stock, for which he won an award from Reynolds aluminum for the most creative use of aluminum foil. Formally trained in graphic design, Wilkes was one of several Los Angeles area artists, including John Van Hamersveld, Warren Dayton and Art Bevacqua, who would eventually create concert posters. But Wilkes clearly was highly influenced by the posters emerging from the San Francisco Psychedelic Art movement beginning around 1966. Perhaps what was most influential about Wilkes’ poster for the Monterey Pop Festival, though, was that it was printed on foil stock. That silvery sheen (ink, however, not actual foil) almost immediately graced several covers of rock albums released within the next year, giving each of them a vaguely psychedelic, or at least acidic, aura (none of which, so far as I know, were designed by Tom Wilkes): Steppenwolf’s eponymous first album (1968), Cream’s Wheels of Fire (1968), and the eponymous first album by Quicksilver Messenger Service (1968). 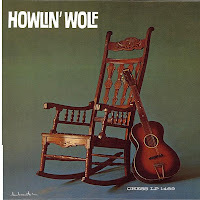 The use of faux aluminum stock, in fact, has graced many albums over the years since. His design of the printed and visual materials associated with the Monterey Pop Festival in 1967 led to Wilkes’ career in the music industry, first as art director at A&M Records. He subsequently designed (or provided art direction or graphic design) for dozens of album covers (a list is available here and images of a few are here), some of them among my all-time favorites, including Beggars Banquet (The Rolling Stones), Harvest (Neil Young), Mad Dogs & Englishmen (Joe Cocker), On Tour (Delaney & Bonnie), and Concert for Bangladesh and All things Must Pass (George Harrison). He also took the famous cover photo of Joplin Joplin for her posthumous album Pearl (1971). The particular effectiveness of Tom Wilkes as an album cover designer was that he was a synesthete, explaining why his images always largely formed an enticing visual equivalent to the music to be found inside. Additional Note: The BD edition of Woodstock issued in the UK includes the Target exclusive material, with different cover art. In addition, you may wish to pick up the Jimi Hendrix Live at Woodstock 2-disc DVD set (which includes “Spanish Castle Magic,” an extra on the Target set) as well. 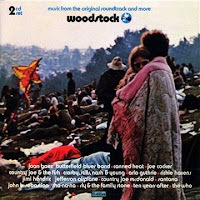 And go here for Tim Lucas’s discussion of the 2CD set Jefferson Airplane—The Woodstock Experience, consisting of JA’s complete performance at Woodstock. 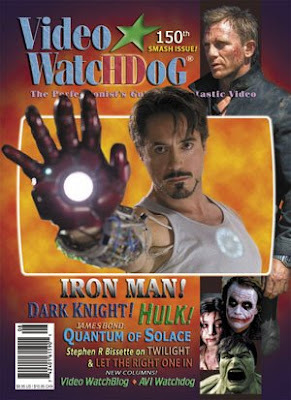 This morning I discovered that late last night Tim Lucas sent Becky and me an email informing us that the preview of VIDEO WATCHDOG #150 had been posted on the VW website so that Becky and I could get an early look at our opening spread in the “150th smash issue.” Last month I wrote about my and Becky’s decade long plus association with Video Watchdog that began in 1998 with issue #45, 105 issues ago. While we’ve contributed to VW for over a decade, that’s certainly not as long as Steve Bissette (whose name, you’ll notice, is on the cover) who has contributed to VW off and on over the two decades of its existence. As I indicated in my blog last month, Becky and I always have been deeply pleased that Tim and Donna showed an almost instant willingness to publish our work, and we’re especially pleased to be part of issue 150. Publishing 150 issues of a specialized journal in the turbulent economic conditions and the technological revolution of the past twenty years is no small feat—many venerable journals have either folded up entirely, or gone strictly to an on-line format. I know that Tim and Donna are justly proud of their accomplishment, as they should be. I remember telling Becky, immediately after we had finished our first two reviews and emailed them off to Tim, that even if he doesn’t accept them, at least we’ve learned something. We’ve found that to be true to this day: writing about a film (or book, or record, etc.) has both deepened our understanding of it various complexities (e.g., themes, characters) and ambiguities, but also its special singularity. 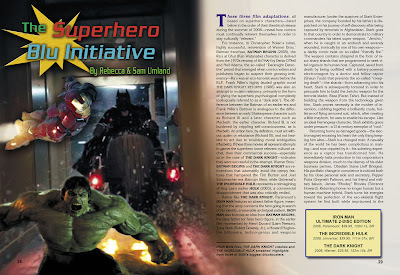 Our latest long review of 2008’s superhero films required us to do a bit of homework, forcing us to refreshen our relationship with the characters by doing some additional reading as well as view the films more than once. And like always, we learned something. Not only do we learn by writing the reviews, but once we turn over our material to Tim—and the past few years, to a second pair of eyes, those belonging to John Charles—whose combined editing skills are simply outstanding, we have the comfort of knowing that not only will our work be, proverbially speaking, gone over with a fine-tooth comb, but any factual errors will be corrected as well. And since Donna Lucas is so masterful with design and layout—she’s careful, thoughtful, and meticulous in her work—the published product is thoroughly professional. Both Becky and I have profited greatly from working with Tim and Donna over the years, and we heartily congratulate them on landmark issue 150. We are pleased to be part of it.